How to Foster Trust with User-Experience Design? A common misconception that is market for a long time is that SEO and content marketing are two mutually exclusive events. As a matter of fact they are intertwined. In a way, it used to be true that keyword stuffing was once used to get the pages ranked well even if the content itself was not valuable. No such a case no longer exist as search algorithms have gone smart and they are more focusing on serving users with the valued content and this is the main goal of the content marketing as well- serving consumers with the content which is valuable to them. That is why now it is fairly simple to build a keyword driven strategy. Determining the relevant keywords for the business still began at Google Adwords Keyword Planner. However, the difference lies in where you should focus when building a keyword driven content strategy. The brainstorming sessions must go beyond the traditional limits such as focusing on what the audience is searching for and what is their motive behind those searches. Focus on their needs and concerns. This is what you will be focusing on through your content but this must also be a part of your keyword planning strategy. Instead of focusing on the general search queries it is now time to shift the attention to long-tailed keywords which people are now a days typing into search box. Google has always been focusing on searching the result relevant to audiences and as a content marketer you should also. Surely, you realize that there is no value in using the keywords which will attract the wrong audience because they will eventually head back to the search engine. That’s why considering the intention of the audiences is important in deciding the keyword strategy. Google is already getting better at it and it’s all thanks to RankBrain. Understand the intention behind the audience search and then choose your keywords because your keyword strategy can help the Google in making better decisions in future. LSI is system which Google uses to determine the relation between different keywords and then uses these relations to determine the searcher’s intent so that it can present him with the most relevant results possible according to the intent of the searcher. As a content marketer you can take advantage of LSI keywords along with your keywords, so that Google better understand your purpose to the searches. After you have decided your on keyword, use LSI keyword generator to come up with the LSI keywords. • What people are searching for? • What are their intentions? • What do they care about? • What are their needs? 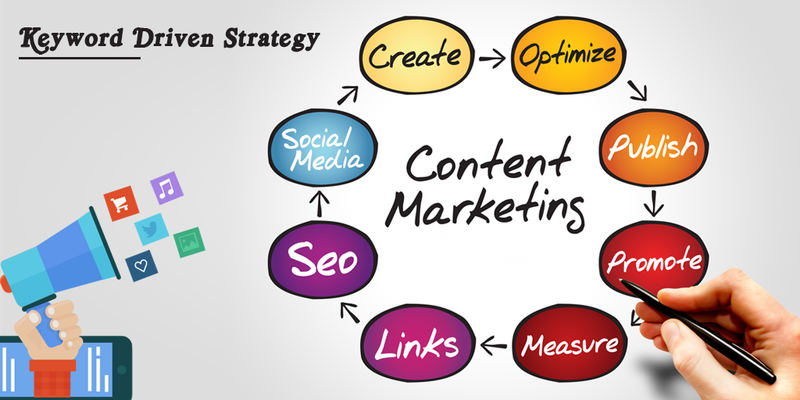 These are some strategies which will help you in giving a boost to your keyword driven content marketing. So let’s get started. How is Custom Content Management System the future of Online Businesses?